Gold has been prized by every major culture and nation state. The appeal of gold has survived the fall of the Egyptian, Greek, Roman, Spanish, and English empires. Gold had been in use for 4,000 years before the birth of Jesus. Throughout civilized history, nations have fought wars to acquire gold, and have spent fortunes to protect it. Today, virtually every major nation state continues to have some form of gold coin in circulation, although the legal tender values are largely symbolic. Gold coins have become highly prized collectibles with values that are, in many cases, exponentially higher than the value of the base gold bullion content value. Gold is indestructible. When gold is heated, it turns to liquid but remains gold. Once cooled, it returns to the familiar solid form everyone recognizes. If gold is dropped into the ocean for hundreds of years, when it returns to the surface it will still be gold. The ability to maintain its integrity without breaking down is why gold became money. People used gold to barter for other commodities like corn, livestock, and others. Gold is an important aspect of a well-diversified investment portfolio. Gold has always maintained its value throughout history. Gold is commonly thought of as a hedge against inflation and should be strongly considered to help protect your wealth. Owning gold and taking physical possession of it is gaining control of part of your wealth. 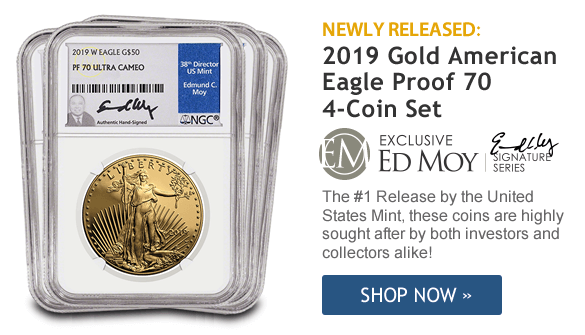 Shop for gold bars and gold coins from the U.S. Mint and around the world. We offer the best prices and make it easy to buy gold bullion for your financial portfolio. All items are guaranteed authentic. There are several reasons to buy silver. The precious metal is used as an investment, as a hedge against inflation, and survival purposes in extremely dire situations. Junk silver has long been considered the optimal barter currency when our society breaks down but silver rounds should also be included in a portfolio for bartering. An advantage the rounds have over junk silver is that they have their weight and purity stamped on the actual coins. 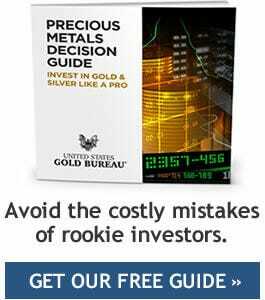 Silver has a much lower price than gold and is a more attainable investment and hedge against inflation for most people. There are many industrial and medical applications for silver because it is electronically conducive, thermally, conductive, and reflective. Products like cellphones, cameras, and laptops all contain silver creating a strong demand for silver. Lowest prices online for silver bars in 6 sizes, plus silver coins from the U.S. Mint, Royal Canadian Mint and more. Shop for modern and historic silver with secure payments and fast shipping. All items are guaranteed authentic. The U.S. Gold Bureau was founded under the premise of bringing trust and integrity to all aspects of the precious metals acquisition process. Our goal is to always exceed our customer’s expectations by helping them to make better, more informed buying decisions. We understand that when acquiring precious metals, you have many choices to consider. Your Precious Metals Specialist will serve as a great resource to guide you step-by-step as you navigate through those choices. Each of our Precious Metals Specialists has been through an extensive training program and is well equipped to assist you at all stages of the process. We will always be honest and upfront with you, we will treat you with respect, and we will complete your order exactly as we have presented it to you – each time, every time.